Part of the reason this blog exists, is to find and share about cool or strange things in the city we think we know. The feature – Deciphering DC – attempts to achieve that. 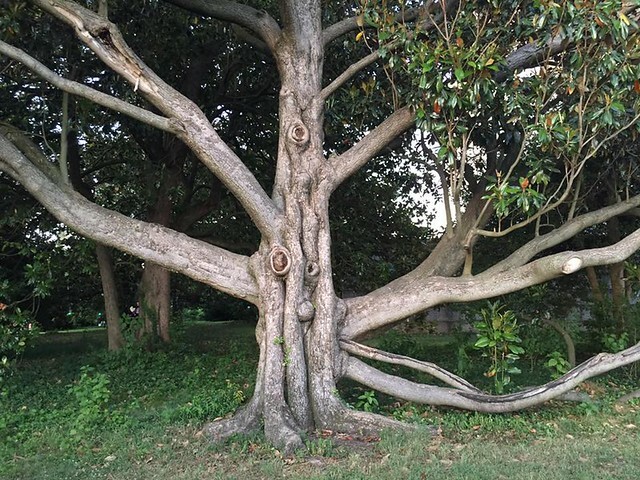 There is a grove of trees on the National Mall, off the beaten path, that is just secluded enough to give you the sense you may have stepped outside of DC. You haven’t. There are many secluded places along the Mall, and I won’t tell you where this particular tree grows, but I will tell you to get out and explore. Find a spot of your own. I refer to this tree as the Kang Tree, because it looks a lot like the alien known as Kang from The Simpsons. It’s a massive magnolia tree, that you can climb and sit on (until the ants find you), or just bask in its shadow with a picnic spread out underneath. Chat with the park rangers on horseback, keeping you honest, sniffing the air for any ‘inappropriate’ beverages.